"Extinct" redirects here. For other uses, see Extinct (disambiguation) and Extinction (disambiguation). In biology, extinction is the termination of an organism or of a group of organisms (taxon), usually a species. The moment of extinction is generally considered to be the death of the last individual of the species, although the capacity to breed and recover may have been lost before this point. Because a species' potential range may be very large, determining this moment is difficult, and is usually done retrospectively. This difficulty leads to phenomena such as Lazarus taxa, where a species presumed extinct abruptly "reappears" (typically in the fossil record) after a period of apparent absence. More than 99 percent of all species, amounting to over five billion species, that ever lived on Earth are estimated to have died out. Estimates on the number of Earth's current species range from 10 million to 14 million, of which about 1.2 million have been documented and over 86 percent have not yet been described. In 2016, scientists reported that 1 trillion species are estimated to be on Earth currently with only one-thousandth of one percent described. Through evolution, species arise through the process of speciation—where new varieties of organisms arise and thrive when they are able to find and exploit an ecological niche—and species become extinct when they are no longer able to survive in changing conditions or against superior competition. The relationship between animals and their ecological niches has been firmly established. A typical species becomes extinct within 10 million years of its first appearance, although some species, called living fossils, survive with virtually no morphological change for hundreds of millions of years. Mass extinctions are relatively rare events; however, isolated extinctions are quite common. Only recently have extinctions been recorded and scientists have become alarmed at the current high rate of extinctions. Most species that become extinct are never scientifically documented. Some scientists estimate that up to half of presently existing plant and animal species may become extinct by 2100. A 2018 report indicated that the phylogenetic diversity of 300 mammalian species erased during the human era since the Late Pleistocene would require 5 to 7 million years to recover. A dagger symbol (†) placed next to the name of a species or other taxon normally indicates its status as extinct. A species is extinct when the last existing member dies. Extinction therefore becomes a certainty when there are no surviving individuals that can reproduce and create a new generation. A species may become functionally extinct when only a handful of individuals survive, which cannot reproduce due to poor health, age, sparse distribution over a large range, a lack of individuals of both sexes (in sexually reproducing species), or other reasons. Pinpointing the extinction (or pseudoextinction) of a species requires a clear definition of that species. 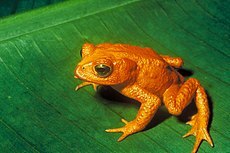 If it is to be declared extinct, the species in question must be uniquely distinguishable from any ancestor or daughter species, and from any other closely related species. Extinction of a species (or replacement by a daughter species) plays a key role in the punctuated equilibrium hypothesis of Stephen Jay Gould and Niles Eldredge. In ecology, extinction is often used informally to refer to local extinction, in which a species ceases to exist in the chosen area of study, but may still exist elsewhere. This phenomenon is also known as extirpation. Local extinctions may be followed by a replacement of the species taken from other locations; wolf reintroduction is an example of this. Species which are not extinct are termed extant. Those that are extant but threatened by extinction are referred to as threatened or endangered species. Currently an important aspect of extinction is human attempts to preserve critically endangered species. These are reflected by the creation of the conservation status "extinct in the wild" (EW). Species listed under this status by the International Union for Conservation of Nature (IUCN) are not known to have any living specimens in the wild, and are maintained only in zoos or other artificial environments. Some of these species are functionally extinct, as they are no longer part of their natural habitat and it is unlikely the species will ever be restored to the wild. When possible, modern zoological institutions try to maintain a viable population for species preservation and possible future reintroduction to the wild, through use of carefully planned breeding programs. The extinction of one species' wild population can have knock-on effects, causing further extinctions. These are also called "chains of extinction". This is especially common with extinction of keystone species. A 2018 study indicated that the 6th mass extinction started in the Late Pleistocene could take up to 5 to 7 million years to restore 2.5 billion years of unique mammal diversity to what it was before the human era. Extinction of a parent species where daughter species or subspecies are still extant is called pseudoextinction or phyletic extinction. Effectively, the old taxon vanishes, transformed (anagenesis) into a successor, or split into more than one (cladogenesis). Pseudoextinction is difficult to demonstrate unless one has a strong chain of evidence linking a living species to members of a pre-existing species. For example, it is sometimes claimed that the extinct Hyracotherium, which was an early horse that shares a common ancestor with the modern horse, is pseudoextinct, rather than extinct, because there are several extant species of Equus, including zebra and donkey. However, as fossil species typically leave no genetic material behind, one cannot say whether Hyracotherium evolved into more modern horse species or merely evolved from a common ancestor with modern horses. Pseudoextinction is much easier to demonstrate for larger taxonomic groups. The coelacanth, a fish related to lungfish and tetrapods, was considered to have been extinct since the end of the Cretaceous Period until 1938 when a specimen was found, off the Chalumna River (now Tyolomnqa) on the east coast of South Africa. Museum curator Marjorie Courtenay-Latimer discovered the fish among the catch of a local angler, Captain Hendrick Goosen, on December 23, 1938. A local chemistry professor, JLB Smith, confirmed the fish's importance with a famous cable: "MOST IMPORTANT PRESERVE SKELETON AND GILLS = FISH DESCRIBED". Far more recent possible or presumed extinctions of species which may turn out still to exist include the thylacine, or Tasmanian tiger (Thylacinus cynocephalus), the last known example of which died in Hobart Zoo in Tasmania in 1936; the Japanese wolf (Canis lupus hodophilax), last sighted over 100 years ago; the ivory-billed woodpecker (Campephilus principalis), last sighted for certain in 1944; and the slender-billed curlew (Numenius tenuirostris), not seen since 2007. As long as species have been evolving, species have been going extinct. It is estimated that over 99.9% of all species that ever lived are extinct. The average lifespan of a species is 1–10 million years, although this varies widely between taxa. There are a variety of causes that can contribute directly or indirectly to the extinction of a species or group of species. "Just as each species is unique", write Beverly and Stephen C. Stearns, "so is each extinction ... the causes for each are varied—some subtle and complex, others obvious and simple". Most simply, any species that cannot survive and reproduce in its environment and cannot move to a new environment where it can do so, dies out and becomes extinct. Extinction of a species may come suddenly when an otherwise healthy species is wiped out completely, as when toxic pollution renders its entire habitat unliveable; or may occur gradually over thousands or millions of years, such as when a species gradually loses out in competition for food to better adapted competitors. Extinction may occur a long time after the events that set it in motion, a phenomenon known as extinction debt. Assessing the relative importance of genetic factors compared to environmental ones as the causes of extinction has been compared to the debate on nature and nurture. The question of whether more extinctions in the fossil record have been caused by evolution or by catastrophe is a subject of discussion; Mark Newman, the author of Modeling Extinction, argues for a mathematical model that falls between the two positions. By contrast, conservation biology uses the extinction vortex model to classify extinctions by cause. When concerns about human extinction have been raised, for example in Sir Martin Rees' 2003 book Our Final Hour, those concerns lie with the effects of climate change or technological disaster. Currently, environmental groups and some governments are concerned with the extinction of species caused by humanity, and they try to prevent further extinctions through a variety of conservation programs. Humans can cause extinction of a species through overharvesting, pollution, habitat destruction, introduction of invasive species (such as new predators and food competitors), overhunting, and other influences. Explosive, unsustainable human population growth is an essential cause of the extinction crisis. According to the International Union for Conservation of Nature (IUCN), 784 extinctions have been recorded since the year 1500, the arbitrary date selected to define "recent" extinctions, up to the year 2004; with many more likely to have gone unnoticed. Several species have also been listed as extinct since 2004. If adaptation increasing population fitness is slower than environmental degradation plus the accumulation of slightly deleterious mutations, then a population will go extinct. Smaller populations have fewer beneficial mutations entering the population each generation, slowing adaptation. It is also easier for slightly deleterious mutations to fix in small populations; the resulting positive feedback loop between small population size and low fitness can cause mutational meltdown. Limited geographic range is the most important determinant of genus extinction at background rates but becomes increasingly irrelevant as mass extinction arises. Limited geographic range is a cause both of small population size and of greater vulnerability to local environmental catastrophes. Extinction rates can be affected not just by population size, but by any factor that affects evolvability, including balancing selection, cryptic genetic variation, phenotypic plasticity, and robustness. A diverse or deep gene pool gives a population a higher chance in the short term of surviving an adverse change in conditions. Effects that cause or reward a loss in genetic diversity can increase the chances of extinction of a species. Population bottlenecks can dramatically reduce genetic diversity by severely limiting the number of reproducing individuals and make inbreeding more frequent. Purebred wild species evolved to a specific ecology can be threatened with extinction through the process of genetic pollution—i.e., uncontrolled hybridization, introgression genetic swamping which leads to homogenization or out-competition from the introduced (or hybrid) species. Endemic populations can face such extinctions when new populations are imported or selectively bred by people, or when habitat modification brings previously isolated species into contact. Extinction is likeliest for rare species coming into contact with more abundant ones; interbreeding can swamp the rarer gene pool and create hybrids, depleting the purebred gene pool (for example, the endangered wild water buffalo is most threatened with extinction by genetic pollution from the abundant domestic water buffalo). Such extinctions are not always apparent from morphological (non-genetic) observations. Some degree of gene flow is a normal evolutionarily process, nevertheless, hybridization (with or without introgression) threatens rare species' existence. The gene pool of a species or a population is the variety of genetic information in its living members. A large gene pool (extensive genetic diversity) is associated with robust populations that can survive bouts of intense selection. Meanwhile, low genetic diversity (see inbreeding and population bottlenecks) reduces the range of adaptions possible. Replacing native with alien genes narrows genetic diversity within the original population, thereby increasing the chance of extinction. Habitat degradation is currently the main anthropogenic cause of species extinctions. The main cause of habitat degradation worldwide is agriculture, with urban sprawl, logging, mining and some fishing practices close behind. The degradation of a species' habitat may alter the fitness landscape to such an extent that the species is no longer able to survive and becomes extinct. This may occur by direct effects, such as the environment becoming toxic, or indirectly, by limiting a species' ability to compete effectively for diminished resources or against new competitor species. Habitat degradation through toxicity can kill off a species very rapidly, by killing all living members through contamination or sterilizing them. It can also occur over longer periods at lower toxicity levels by affecting life span, reproductive capacity, or competitiveness. Habitat degradation can also take the form of a physical destruction of niche habitats. The widespread destruction of tropical rainforests and replacement with open pastureland is widely cited as an example of this; elimination of the dense forest eliminated the infrastructure needed by many species to survive. For example, a fern that depends on dense shade for protection from direct sunlight can no longer survive without forest to shelter it. Another example is the destruction of ocean floors by bottom trawling. Diminished resources or introduction of new competitor species also often accompany habitat degradation. Global warming has allowed some species to expand their range, bringing unwelcome[according to whom?] competition to other species that previously occupied that area. Sometimes these new competitors are predators and directly affect prey species, while at other times they may merely outcompete vulnerable species for limited resources. Vital resources including water and food can also be limited during habitat degradation, leading to extinction. In the natural course of events, species become extinct for a number of reasons, including but not limited to: extinction of a necessary host, prey or pollinator, inter-species competition, inability to deal with evolving diseases and changing environmental conditions (particularly sudden changes) which can act to introduce novel predators, or to remove prey. Recently in geological time, humans have become an additional cause of extinction (many people would say premature extinction) of some species, either as a new mega-predator or by transporting animals and plants from one part of the world to another. Such introductions have been occurring for thousands of years, sometimes intentionally (e.g. livestock released by sailors on islands as a future source of food) and sometimes accidentally (e.g. rats escaping from boats). In most cases, the introductions are unsuccessful, but when an invasive alien species does become established, the consequences can be catastrophic. Invasive alien species can affect native species directly by eating them, competing with them, and introducing pathogens or parasites that sicken or kill them; or indirectly by destroying or degrading their habitat. Human populations may themselves act as invasive predators. According to the "overkill hypothesis", the swift extinction of the megafauna in areas such as Australia (40,000 years before present), North and South America (12,000 years before present), Madagascar, Hawaii (AD 300–1000), and New Zealand (AD 1300–1500), resulted from the sudden introduction of human beings to environments full of animals that had never seen them before, and were therefore completely unadapted to their predation techniques. Coextinction refers to the loss of a species due to the extinction of another; for example, the extinction of parasitic insects following the loss of their hosts. Coextinction can also occur when a species loses its pollinator, or to predators in a food chain who lose their prey. "Species coextinction is a manifestation of the interconnectedness of organisms in complex ecosystems ... While coextinction may not be the most important cause of species extinctions, it is certainly an insidious one". 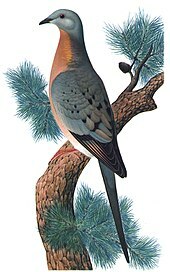 Coextinction is especially common when a keystone species goes extinct. Models suggest that coextinction is the most common form of biodiversity loss. There may be a cascade of coextinction across the trophic levels. Such effects are most severe in mutualistic and parasitic relationships. An example of coextinction is the Haast's eagle and the moa: the Haast's eagle was a predator that became extinct because its food source became extinct. The moa were several species of flightless birds that were a food source for the Haast's eagle. Extinction as a result of climate change has been confirmed by fossil studies. Particularly, the extinction of amphibians during the Carboniferous Rainforest Collapse, 305 million years ago. A 2003 review across 14 biodiversity research centers predicted that, because of climate change, 15–37% of land species would be "committed to extinction" by 2050. The ecologically rich areas that would potentially suffer the heaviest losses include the Cape Floristic Region, and the Caribbean Basin. These areas might see a doubling of present carbon dioxide levels and rising temperatures that could eliminate 56,000 plant and 3,700 animal species. Climate change has also been found to be a factor in habitat loss and desertification. There have been at least five mass extinctions in the history of life on earth, and four in the last 350 million years in which many species have disappeared in a relatively short period of geological time. A massive eruptive event is considered to be one likely cause of the "Permian–Triassic extinction event" about 250 million years ago, which is estimated to have killed 90% of species then existing. There is also evidence to suggest that this event was preceded by another mass extinction, known as Olson's Extinction. 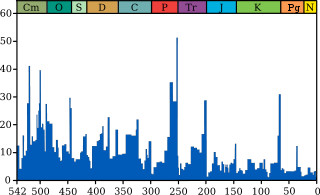 The Cretaceous–Paleogene extinction event (K-Pg) occurred 66 million years ago, at the end of the Cretaceous period, and is best known for having wiped out non-avian dinosaurs, among many other species. According to a 1998 survey of 400 biologists conducted by New York's American Museum of Natural History, nearly 70% believed that the Earth is currently in the early stages of a human-caused mass extinction, known as the Holocene extinction. In that survey, the same proportion of respondents agreed with the prediction that up to 20% of all living populations could become extinct within 30 years (by 2028). A 2014 special edition of Science declared there is widespread consensus on the issue of human-driven mass species extinctions. Biologist E. O. Wilson estimated  in 2002 that if current rates of human destruction of the biosphere continue, one-half of all plant and animal species of life on earth will be extinct in 100 years. More significantly, the current rate of global species extinctions is estimated as 100 to 1000 times "background" rates (the average extinction rates in the evolutionary time scale of planet Earth), while future rates are likely 10,000 times higher. However, some groups are going extinct much faster. 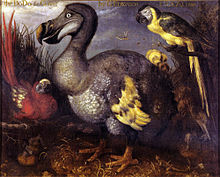 Biologists Paul R. Ehrlich and Stuart Pimm, among others, contend that human population growth and overconsumption are the main drivers of the modern extinction crisis. Georges Cuvier compared fossil mammoth jaws to those of living elephants, concluding that they were distinct from any known living species. For much of history, the modern understanding of extinction as the end of a species was incompatible with the prevailing worldview. Through the 18th century, much of Western society adhered to the belief that the world was created by God and as such was complete and perfect. This concept reached its heyday in the 1700s with the peak popularity of a theological concept called the Great Chain of Being, in which all life on earth, from the tiniest microorganism to God, is linked in a continuous chain. The extinction of a species was impossible under this model, as it would create gaps or missing links in the chain and destroy the natural order. Thomas Jefferson was a firm supporter of the Great Chain of Being and an opponent of extinction, famously denying the extinction of the wooly mammoth on the grounds that nature never allows a race of animals to become extinct. 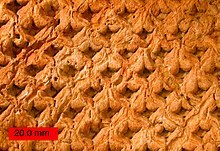 A series of fossils were discovered in the late 17th century that appeared unlike any living species. As a result, the scientific community embarked on a voyage of creative rationalization, seeking to understand what had happened to these species within a framework that did not account for total extinction. In October 1686, Robert Hooke presented an impression of a nautilus to the Royal Society that was more than two feet in diameter, and morphologically distinct from any known living species. Hooke theorized that this was simply because the species lived in the deep ocean and no one had discovered them yet. While he contended that it was possible a species could be "lost", he thought this highly unlikely. Similarly, in 1695, Thomas Molyneux published an account of enormous antlers found in Ireland that did not belong to any extant taxa in that area. Molyneux reasoned that they came from the North American moose and that the animal had once been common on the British Isles. Rather than suggest that this indicated the possibility of species going extinct, he argued that although organisms could become locally extinct, they could never be entirely lost and would continue to exist in some unknown region of the globe. Using the antlers as evidence for this position, Molyneux described how moose had continued to exist in North America even as they were lost to the British Isles. The antlers were later confirmed to be from the extinct Irish elk Megaloceros. Hooke and Molyneux's line of thinking was difficult to disprove. When parts of the world had not been thoroughly examined and charted, scientists could not rule out that animals found only in the fossil record were not simply "hiding" in unexplored regions of the Earth. Georges Cuvier is credited with establishing the modern conception of extinction in a 1796 lecture to the French Institute, though he would spend most of his career trying to convince the wider scientific community of his theory. Cuvier was a well-regarded geologist, lauded for his ability to reconstruct the anatomy of an unknown species from a few fragments of bone. His primary evidence for extinction came from mammoth skulls found in the Paris basin. Cuvier recognized them as distinct from any known living species of elephant, and argued that it was highly unlikely such an enormous animal would go undiscovered. In 1812, Cuvier, along with Alexandre Bronigniart & Geoffroy Saint-Hilaire, mapped the strata of the Paris basin. They saw alternating saltwater and freshwater deposits, as well as patterns of the appearance and disappearance of fossils throughout the record. From these patterns, Cuvier inferred historic cycles of catastrophic flooding, extinction, and repopulation of the earth with new species. Cuvier's fossil evidence showed that very different life forms existed in the past than those that exist today, a fact that was accepted by most scientists. The primary debate focused whether this turnover caused by extinction was gradual or abrupt in nature. Cuvier understood extinction to be the result of cataclysmic events that wipe out huge numbers of species, as opposed to the gradual decline of a species over time. His catastrophic view of the nature of extinction garnered him many opponents in the newly emerging school of uniformitarianism. Jean-Baptist Lamarck, a gradualist and colleague of Cuvier, saw the fossils of different life forms as evidence of the mutable character of species. While Lamarck did not deny the possibility of extinction, he believed that it was exceptional and rare and that most of the change in species over time was due to gradual change. Unlike Cuvier, Lamarck was skeptical that catastrophic events of a scale large enough to cause total extinction were possible. In his geological history of the earth titled Hydrogeologie, Lamarck instead argued that the surface of the earth was shaped by gradual erosion and deposition by water, and that species changed over time in response to the changing environment. Charles Lyell, a noted geologist and founder of uniformitarianism, believed that past processes should be understood using present day processes. Like Lamarck, Lyell acknowledged that extinction could occur, noting the total extinction of the dodo and the extirpation of indigenous horses to the British Isles. He similarly argued against mass extinctions, believing that any extinction must be a gradual process. Lyell also showed that Cuvier's original interpretation of the Parisian strata was incorrect. Instead of the catastrophic floods inferred by Cuvier, Lyell demonstrated that patterns of saltwater and freshwater deposits, like those seen in the Paris basin, could be formed by a slow rise and fall of sea levels. The concept of extinction was integral to Charles Darwin’s On the Origin of Species, with less fit lineages disappearing over time. For Darwin, extinction was a constant side effect of competition. Because of the wide reach of On the Origin of Species, it was widely accepted that extinction occurred gradually and evenly (a concept we now refer to as background extinction). It was not until 1982, when David Raup and Jack Sepkoski published their seminal paper on mass extinctions, that Cuvier was vindicated and catastrophic extinction was accepted as an important mechanism. The current understanding of extinction is a synthesis of the cataclysmic extinction events proposed by Cuvier, and the background extinction events proposed by Lyell and Darwin. Extinction is an important research topic in the field of zoology, and biology in general, and has also become an area of concern outside the scientific community. A number of organizations, such as the Worldwide Fund for Nature, have been created with the goal of preserving species from extinction. Governments have attempted, through enacting laws, to avoid habitat destruction, agricultural over-harvesting, and pollution. While many human-caused extinctions have been accidental, humans have also engaged in the deliberate destruction of some species, such as dangerous viruses, and the total destruction of other problematic species has been suggested. Other species were deliberately driven to extinction, or nearly so, due to poaching or because they were "undesirable", or to push for other human agendas. One example was the near extinction of the American bison, which was nearly wiped out by mass hunts sanctioned by the United States government, to force the removal of Native Americans, many of whom relied on the bison for food. Biologist Bruce Walsh of the University of Arizona states three reasons for scientific interest in the preservation of species: genetic resources, ecosystem stability, and ethics; and today the scientific community "stress[es] the importance" of maintaining biodiversity. In modern times, commercial and industrial interests often have to contend with the effects of production on plant and animal life. However, some technologies with minimal, or no, proven harmful effects on Homo sapiens can be devastating to wildlife (for example, DDT). Biogeographer Jared Diamond notes that while big business may label environmental concerns as "exaggerated", and often cause "devastating damage", some corporations find it in their interest to adopt good conservation practices, and even engage in preservation efforts that surpass those taken by national parks. Governments sometimes see the loss of native species as a loss to ecotourism, and can enact laws with severe punishment against the trade in native species in an effort to prevent extinction in the wild. Nature preserves are created by governments as a means to provide continuing habitats to species crowded by human expansion. The 1992 Convention on Biological Diversity has resulted in international Biodiversity Action Plan programmes, which attempt to provide comprehensive guidelines for government biodiversity conservation. Advocacy groups, such as The Wildlands Project and the Alliance for Zero Extinctions, work to educate the public and pressure governments into action. People who live close to nature can be dependent on the survival of all the species in their environment, leaving them highly exposed to extinction risks. However, people prioritize day-to-day survival over species conservation; with human overpopulation in tropical developing countries, there has been enormous pressure on forests due to subsistence agriculture, including slash-and-burn agricultural techniques that can reduce endangered species's habitats. Antinatalist philosopher David Benatar concludes that any popular concern about non-human species extinction usually arises out of concern about how the loss of a species will impact human wants and needs, that "we shall live in a world impoverished by the loss of one aspect of faunal diversity, that we shall no longer be able to behold or use that species of animal." He notes that typical concerns about possible human extinction, such as the loss of individual members, are not considered in regards to non-human species extinction. The smallpox virus is now extinct in the wild, although samples are retained in laboratory settings. The rinderpest virus, which infected domestic cattle, is now extinct in the wild. The poliovirus is now confined to small parts of the world due to extermination efforts. Dracunculus medinensis, a parasitic worm which causes the disease dracunculiasis, is now close to eradication thanks to efforts led by the Carter Center. Treponema pallidum pertenue, a bacterium which causes the disease yaws, is in the process of being eradicated. Biologist Olivia Judson has advocated the deliberate extinction of certain disease-carrying mosquito species. In a September 25, 2003 article in The New York Times, she advocated "specicide" of thirty mosquito species by introducing a genetic element which can insert itself into another crucial gene, to create recessive "knockout genes". She says that the Anopheles mosquitoes (which spread malaria) and Aedes mosquitoes (which spread dengue fever, yellow fever, elephantiasis, and other diseases) represent only 30 species; eradicating these would save at least one million human lives per annum, at a cost of reducing the genetic diversity of the family Culicidae by only 1%. She further argues that since species become extinct "all the time" the disappearance of a few more will not destroy the ecosystem: "We're not left with a wasteland every time a species vanishes. Removing one species sometimes causes shifts in the populations of other species—but different need not mean worse." In addition, anti-malarial and mosquito control programs offer little realistic hope to the 300 million people in developing nations who will be infected with acute illnesses this year. Although trials are ongoing, she writes that if they fail: "We should consider the ultimate swatting." Biologist E. O. Wilson has advocated the eradication of several species of mosquito, including malaria vector Anopheles gambiae. Wilson stated, "I'm talking about a very small number of species that have co-evolved with us and are preying on humans, so it would certainly be acceptable to remove them. I believe it's just common sense." Some, such as Harvard geneticist George M. Church, believe that ongoing technological advances will let us "bring back to life" an extinct species by cloning, using DNA from the remains of that species. Proposed targets for cloning include the mammoth, the thylacine, and the Pyrenean ibex. For this to succeed, enough individuals would have to be cloned, from the DNA of different individuals (in the case of sexually reproducing organisms) to create a viable population. Though bioethical and philosophical objections have been raised, the cloning of extinct creatures seems theoretically possible. In 2003, scientists tried to clone the extinct Pyrenean ibex (C. p. pyrenaica). This attempt failed: of the 285 embryos reconstructed, 54 were transferred to 12 mountain goats and mountain goat-domestic goat hybrids, but only two survived the initial two months of gestation before they too died. In 2009, a second attempt was made to clone the Pyrenean ibex: one clone was born alive, but died seven minutes later, due to physical defects in the lungs. ^ Kunin, W.E. ; Gaston, Kevin, eds. (1996). The Biology of Rarity: Causes and consequences of rare–common differences. ISBN 978-0412633805. Retrieved 26 May 2015. ^ Stearns, Beverly Peterson; Stearns, S.C.; Stearns, Stephen C. (2000). Watching, from the Edge of Extinction. Yale University Press. p. preface x. ISBN 978-0-300-08469-6. Retrieved 30 May 2017. ^ Novacek, Michael J. (8 November 2014). "Prehistory's Brilliant Future". The New York Times. Retrieved 2014-12-25. ^ a b c Newman, Mark (1997). "A model of mass extinction". Journal of Theoretical Biology. 189 (3): 235–252. arXiv:adap-org/9702003. doi:10.1006/jtbi.1997.0508. PMID 9441817. ^ G. Miller; Scott Spoolman (2012). Environmental Science – Biodiversity Is a Crucial Part of the Earth's Natural Capital. Cengage Learning. p. 62. ISBN 978-1-133-70787-5. Retrieved 2014-12-27. ^ Staff (2 May 2016). "Researchers find that Earth may be home to 1 trillion species". National Science Foundation. Retrieved 6 May 2016. ^ a b Species disappearing at an alarming rate, report says. MSNBC. Retrieved July 26, 2006. ^ Ceballos, Gerardo; Ehrlich, Paul R.; Barnosky, Anthony D.; García, Andrés; Pringle, Robert M.; Palmer, Todd M. (2015). "Accelerated modern human–induced species losses: Entering the sixth mass extinction". Science Advances. 1 (5): e1400253. Bibcode:2015SciA....1E0253C. doi:10.1126/sciadv.1400253. PMID 26601195. ^ Ripple WJ, Wolf C, Newsome TM, Galetti M, Alamgir M, Crist E, Mahmoud MI, Laurance WF (13 November 2017). "World Scientists' Warning to Humanity: A Second Notice". BioScience. 67 (12): 1026–1028. doi:10.1093/biosci/bix125. Moreover, we have unleashed a mass extinction event, the sixth in roughly 540 million years, wherein many current life forms could be annihilated or at least committed to extinction by the end of this century. ^ a b Davis M, Faurby S, Svenning JC (2018). "Mammal diversity will take millions of years to recover from the current biodiversity crisis". Proc Natl Acad Sci U S A. 115 (44): 11262–11267. doi:10.1073/pnas.1804906115. PMC 6217385. PMID 30322924. ^ Diamond, Jared (1999). "Up to the Starting Line". Guns, Germs, and Steel. W.W. Norton. pp. 43–44. ISBN 978-0-393-31755-8. ^ Quince, C.; et al. "Deleting species from model food webs" (PDF). Archived from the original (PDF) on 2006-09-25. Retrieved 2007-02-15. ^ Mosbergen, Dominique (2018-10-16). "Mammals Will Still Be Recovering From Human Destruction Long After We're Gone". Huffington Post. Retrieved 2018-10-16. ^ King, Michael; Mulligan, Pamela; Stansfield, William (2014). A Dictionary of Genetics (8th ed.). Oxford University Press. ^ Leighton, Lindsey R. (2009). "Taxon Characteristics That Promote Survivorship Through the Permian-Triassic Interval: Transition from the Paleozoic to the Mesozoic Brachiopod Fauna". Paleobiology. 34: 65–79. doi:10.1666/06082.1. ^ Mills, L. Scott (2009). Conservation of Wildlife Populations: Demography, Genetics and Management. John Wiley & Sons. p. 13. ISBN 978-1-4443-0893-8. ^ Stearns, Beverly Peterson and Stephen C. (2000). "Preface". Watching, from the Edge of Extinction. Yale University Press. pp. x. ISBN 978-0-300-08469-6. ^ Raup, David M.; J. John Sepkoski Jr. (March 1982). "Mass extinctions in the marine fossil record". Science. 215 (4539): 1501–1503. Bibcode:1982Sci...215.1501R. doi:10.1126/science.215.4539.1501. PMID 17788674. ^ "Population Bomb Author's Fix For Next Extinction: Educate Women". Scientific American. August 12, 2008. ^ "2004 Red List". IUCN Red List of Threatened Species. World Conservation Union. Archived from the original on January 13, 2008. Retrieved September 20, 2006. ^ Bertram, J; Gomez, K; Masel, J (February 2017). "Predicting patterns of long-term adaptation and extinction with population genetics". Evolution. 71 (2): 204–214. arXiv:1605.08717. doi:10.1111/evo.13116. PMID 27868195. ^ Payne, J.L. ; S. Finnegan (2007). "The effect of geographic range on extinction risk during background and mass extinction". Proc. Natl. Acad. Sci. 104 (25): 10506–10511. Bibcode:2007PNAS..10410506P. doi:10.1073/pnas.0701257104. PMC 1890565. PMID 17563357. ^ Mooney, H.A. ; Cleland, E.E. (2001). "The evolutionary impact of invasive species". PNAS. 98 (10): 5446–5451. Bibcode:2001PNAS...98.5446M. doi:10.1073/pnas.091093398. PMC 33232. PMID 11344292. ^ a b "Australia's state of the forests report" (PDF). 2003. p. 107. Archived from the original (PDF) on 2011-03-13. ^ Potts, Brad M. (September 2001). Genetic pollution from farm forestry using eucalypt species and hybrids : a report for the RIRDC/L&WA/FWPRDC Joint Venture Agroforestry Program. Robert C. Barbour, Andrew B. Hingston. Australian Government, Rural Industrial Research and Development Corporation. ISBN 978-0-642-58336-9. ^ Lee, Anita. "The Pleistocene Overkill Hypothesis Archived October 14, 2006, at the Wayback Machine." University of California at Berkeley Geography Program.'.' Retrieved January 11, 2007. ^ Koh, Lian Pih. Science, Vol 305, Issue 5690, 1632–1634, 10 September 2004. ^ Dunn, Robert; Nyeema Harris; Robert Colwell; Lian Pin Koh; Navjot Sodhi (2009). "Proceedings of the Royal Society". The sixth mass coextinction: are most endangered species parasites and mutualists?. The Royal Society. Retrieved April 20, 2011. ^ Bhattacharya, Shaoni (7 January 2004). "Global warming threatens millions of species". New Scientist. Retrieved 2010-05-28. the effects of climate change should be considered as great a threat to biodiversity as the "Big Three"—habitat destruction, invasions by alien species and overexploitation by humans. ^ Gibbon, J. Whitfield; Scott, David E.; Ryan, Travis J.; Buhlmann, Kurt A.; Tuberville, Tracey D.; Metts, Brian S.; Greene, Judith L.; Mills, Tony; Leiden, Yale (2000-08-01). "The Global Decline of Reptiles, Déjà Vu Amphibians". BioScience. 50 (8): 653–666. doi:10.1641/0006-3568(2000)050[0653:TGDORD]2.0.CO;2. ISSN 0006-3568. ^ a b Sahney, S.; Benton, M.J. (2008). "Recovery from the most profound mass extinction of all time" (PDF). Proceedings of the Royal Society B: Biological Sciences. 275 (1636): 759–765. doi:10.1098/rspb.2007.1370. PMC 2596898. PMID 18198148. ^ Benton M J (2005). When Life Nearly Died: The Greatest Mass Extinction of All Time. Thames & Hudson. ISBN 978-0-500-28573-2. ^ American Museum of Natural History. "National Survey Reveals Biodiversity Crisis – Scientific Experts Believe We are in the Midst of the Fastest Mass Extinction in Earth's History". Retrieved September 20, 2006. ^ Vignieri, S. (25 July 2014). "Vanishing fauna (Special issue)". Science. 345 (6195): 392–412. doi:10.1126/science.345.6195.392. PMID 25061199. ^ Wilson, E.O. (April 30, 2012). ""E. O. Wilson wants to know why you're not protesting in the streets"". Grist (Interview). Interviewed by Lisa Hymas. Retrieved January 16, 2014. E.O. Wilson repeats his estimation in 2012. ^ a b De Vos; et al. (2014). "Estimating the Normal Background Rate of Species Extinction". Conservation Biology. 29 (2): 452–462. doi:10.1111/cobi.12380. ^ Pimm, S.L. ; Jenkins, C.N. ; Abell, R.; Brooks, T.M. ; Gittleman, J.L. ; Joppa, L.N. ; Raven, P.H. ; Roberts, C.M. ; Sexton, J.O. (30 May 2014). "The biodiversity of species and their rates of extinction, distribution, and protection" (PDF). Science. 344 (6187): 1246752. doi:10.1126/science.1246752. PMID 24876501. Retrieved 15 December 2016. The overarching driver of species extinction is human population growth and increasing per capita consumption. ^ Sutter, John D. (December 12, 2016). "How to stop the sixth mass extinction". CNN. Retrieved January 3, 2017. ^ Ceballos, Gerardo; Ehrlich, Paul R; Dirzo, Rodolfo (23 May 2017). "Biological annihilation via the ongoing sixth mass extinction signaled by vertebrate population losses and declines". PNAS. 114 (30): E6089–E6096. doi:10.1073/pnas.1704949114. PMC 5544311. PMID 28696295. ^ Graham, Chris (July 11, 2017). "Earth undergoing sixth 'mass extinction' as humans spur 'biological annihilation' of wildlife". The Telegraph. Retrieved July 23, 2017. ^ a b c d e f "Extinctions: Georges Cuvier". evolution.berkeley.edu. Retrieved 2017-05-04. ^ a b c d Rowland, Stephen (2009). "Thomas Jefferson, extinction, and the evolving view of Earth history in the late eighteenth and early nineteenth centuries". GSA Memoirs. 203: 225–246. ^ a b c d e f Lyells, Charles (1854). The Principles of Geology or, The Modern Changes of the Earth and its Inhabitants Considered as Illustrative of Geology. New York: Appleton Co.
^ a b c d e f g Bressan, David. "On the Extinction of Species". Scientific American Blog Network. Retrieved 2017-05-04. ^ a b c d Vidal, Fernando; Dias, Nélia (2015). Endangerment, Biodiversity and Culture. Routledge. ISBN 978-1-317-53807-3. ^ Inwood, Stephen (2005). The Forgotten Genius: The Biography of Robert Hooke, 1635–1703. MacAdam/Cage Publishing. ISBN 978-1-59692-115-3. ^ a b c Molyneux, Thomas (1695-01-01). "A Discourse Concerning the Large Horns Frequently Found under Ground in Ireland, Concluding from Them That the Great American Deer, Call'd a Moose, Was Formerly Common in That Island: With Remarks on Some Other Things Natural to That Country. By Thomas Molyneux, M.D. Fellow of the King and Queens Colledge of Physicians inIreland, and of the Royal Society in England". Philosophical Transactions. 19 (215–235): 489–512. doi:10.1098/rstl.1695.0083. ISSN 0261-0523. ^ a b c d e f g Trevor., Palmer (2003). Perilous planet earth : catastrophes and catastrophism through the ages. Cambridge University Press. ISBN 978-0-521-81928-2. OCLC 912273245. ^ a b S., Rudwick, M.J. (1998). Georges Cuvier, fossil bones, and geological catastrophes : new translations & interpretations of the primary texts. University of Chicago Press. ISBN 978-0-226-73106-3. OCLC 45730036. ^ Renato), Mandelbaum, Jonathan (Jonathan (1988). The age of Lamarck : evolutionary theories in France, 1790–1830. University of California Press. ISBN 978-0-520-05830-9. OCLC 898833548. ^ "The Lost World". The New Yorker. Retrieved 2017-05-31. ^ C. Cormack Gates; Curtis H. Freese; Peter J.P. Gogan; Mandy Kotzman (2010). American bison: status survey and conservation guidelines 2010. IUCN. p. 15. ISBN 978-2-8317-1149-2. Retrieved 6 November 2011. ^ a b Walsh, Bruce. Extinction Archived 1997-08-02 at the Wayback Machine. Bioscience at University of Arizona. Retrieved July 26, 2006. ^ Committee on Recently Extinct Organisms. "Why Care About Species That Have Gone Extinct?". Retrieved July 30, 2006. ^ International Programme on Chemical Safety (1989). "DDT and its Derivatives – Environmental Aspects". Environmental Health Criteria 83. Retrieved September 20, 2006. ^ Diamond, Jared (2005). "A Tale of Two Farms". Collapse. Penguin. pp. 15–17. ISBN 978-0-670-03337-9. ^ Drewry, Rachel. "Ecotourism: Can it save the orangutans? Archived February 16, 2007, at the Wayback Machine" Inside Indonesia. Retrieved January 26, 2007. ^ The Wildlands Project Archived November 22, 2005, at the Wayback Machine. Retrieved January 26, 2007. ^ Alliance for Zero Extinctions Archived April 23, 2011, at the Wayback Machine. Retrieved January 26, 2007. ^ Ehrlich, Anne (1981). Extinction: The Causes and Consequences of the Disappearance of Species. Random House, New York. ISBN 978-0-394-51312-6. ^ Benatar, David (2008). Better Never to Have Been: The Harm of Coming into Existence. Oxford University Press. p. 197. ISBN 978-0-19-954926-9. It is noteworthy that human concern about human extinction takes a different form from human concern (where there is any) about the extinction of non-human species. Most humans who are concerned about the extinction of non-human species are not concerned about the individual animals whose lives are cut short in the passage to extinction, even though that is one of the best reasons to be concerned about extinction (at least in its killing form). The popular concern about animal extinction is usually concern for humans—that we shall live in a world impoverished by the loss of one aspect of faunal diversity, that we shall no longer be able to behold or use that species of animal. In other words, none of the typical concerns about human extinction are applied to non-human species extinction. ^ "Smallpox". WHO Factsheet. Archived from the original on 2007-09-21. ^ Dennis Normile (2008). "Driven to Extinction". Science. 319 (5870): 1606–1609. doi:10.1126/science.319.5870.1606. PMID 18356500. Retrieved 2009-03-28. ^ "Polio cases in the world in 2015". The Global Polio Eradication Initiative. Retrieved 17 February 2016. ^ "This Species is Close to Extinction and That's a Good Thing". Time. 23 January 2015. Retrieved 17 February 2016. ^ a b Olivia Judson (September 25, 2003). "A Bug's Death". The New York Times. Retrieved 17 February 2016. ^ "Why a famous biologist wants to eradicate killer mosquitoes". PRI. ^ A. Zitner (2000-12-24). "Cloned Goat Would Revive Extinct Line". Los Angeles Times. Retrieved 2010-05-17. ^ Nicholas wade (2008-11-19). "Regenerating a Mammoth for $10 Million". The New York Times. Retrieved 2010-05-17. The cell could be converted into an embryo and brought to term by an elephant, a project he estimated would cost some $10 million. "This is something that could work, though it will be tedious and expensive,"
^ Steve Connor (2009-02-02). "Cloned goat dies after attempt to bring species back from extinction". The Independent. London. Retrieved 2010-05-17. ^ Gray, Richard; Dobson, Roger (31 Jan 2009). "Extinct ibex is resurrected by cloning". Telegraph. London. Look up extinction in Wiktionary, the free dictionary. 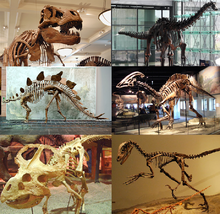 Wikimedia Commons has media related to Extinction. Wikisource has the text of the 1905 New International Encyclopedia article Extinction of Species.